This post is brought to you courtesy of our daycare with a random Saturday morning event. This meant a couple hours without our toddler baby. I couldn’t muster the energy to get to the gym (nor have I for the past year) but a relaxing morning creating a long-due blog post was a great idea. So, I joined this thing called Instagram a while ago. And never shared anything. Until now. Thank goodness I got my share of summer while I was still in Houston. Spending a month in Africa was sunny, but still a bit nippy, and definitely not that green. Our first week back in Canada was hot and humid, but that was an anomaly. Toronto didn’t get much of a summer this year, either. Without restraint, I added them to my morning oats and carefully crafted this salad courtesy of Terry’sFrom Salad Samurai. 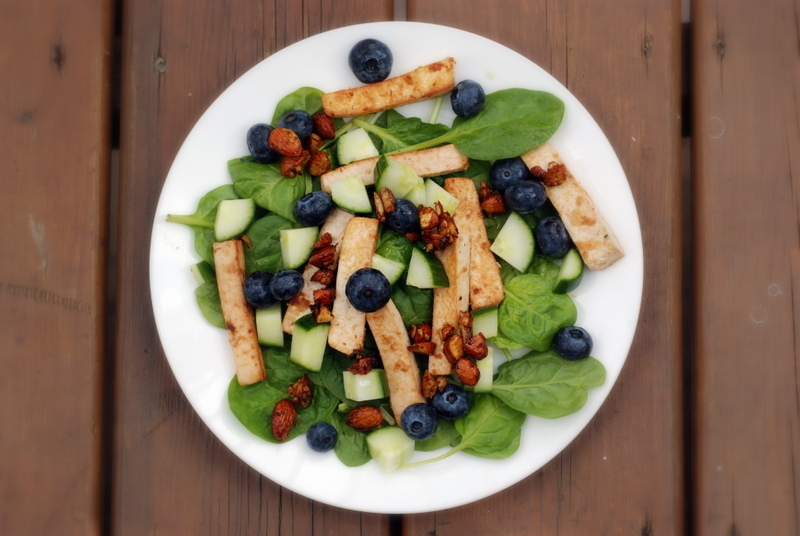 A multi-component, main dish salad with a spinach base, filled with cucumber and blueberries, beefed up with Ginger Beer tofu and topped with sticky, sweet & savoury almonds with Chinese 5-spice. I tried to stay true to the recipe, but only changes were to decrease the tamari because it was an ever-present ingredient in nearly all the components. I also did not want to turn on my oven for the tofu, so I pan-fried it in its marinade. It wasn’t as crispy as it would have been baked, but still good. The star of the salad, other than the big blueberries, were the Chinese 5-spiced glazed almonds which were perfectly balanced with the tamari, agave and the Chinese 5-spice imparted an interesting edge that I did not expect to taste so good. This was not my first salad from the cookbook and it will certainly not be my last. Because the salads are huge ensembles of dressings, flavoured mains and interesting toppings, it can be hard to settle down and make an entire salad. Terry has some tips to master your art of making heavenly salads throughout the week. I have been picking and choosing each component separately, although, I really want to make everything: Thai Seitan Larb in Lettuce Cups, Lentil Pate Banh Mi Salad Rolls, East-West Roasted Corn Salad, Green Papaya Salad with Lemongrass Tofu, Miso Edamame Succotash Salad, Seitan Bacon Wedge Salad with Horseradish Dressing, Kimchi Black Rice with Asian Pear, Collards and Sweet Potato Crunch Bowl… ok, ok, I will stop. I basically want to make everything. The recipes are grouped by season and feature salads with loads of flavour from lots of fresh vegetables (no kidding) but also fresh herbs and spices. Terry also has a fun chapter for sweet salads, including a coconut carrot cake salad and overnight oats with Mexican chocolate creme that are calling out for salads for breakfast and dessert, too. Trust me, I am looking forward to cooking through this throughout the whole year. Thankfully, the publisher is letting me share the recipe AND give a cookbook to one reader living anywhere in the world (since I will be shipping it). To be entered, please leave a comment here, telling me about your favourite salad. I will randomly select a winner on September 5, 2014. Good luck! I am sharing this with Souper Sundays and this month’s Vegetable Palette. Have you checked out some of the other blogs on the Great Vegan Bean Book Blog Tour yet? I keep bookmarking more recipes to try. I feel like the majority of the cookbook is earmarked, to be honest. I thought it might be nice to cook up a bunch more of the recipes and let you know how they were.. but then I made my second dish and decided to not delay my post any longer. The beans were fabulous. Everyone has their go-to baked bean recipe. I did not grow up with baked beans, so I keep trying out new versions. Mango BBQ Beans are one of my favourites, but I also enjoyed the robust Slow-Cooked Nova Scotian Baked Beans with blackstrap molasses and pumpkin seed butter. 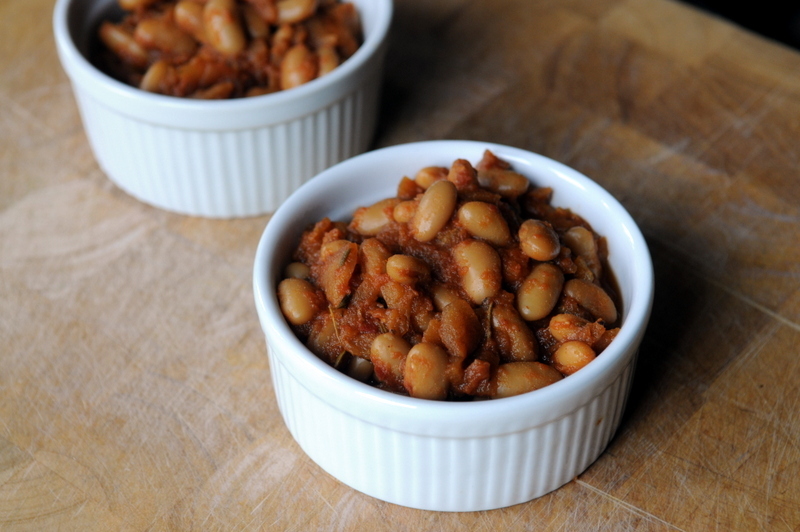 Like the Mango BBQ beans, these apple baked beans are simply simmered on the stovetop. They are also sweetened with fruit and since I used pureed canned tomatoes instead of tomato sauce, the sauce was lighter. A dash of molasses, Dijon mustard and apple cider vinegar make a complex sauce which is also flavoured with rosemary, thyme and smoked paprika. Weird, but it works. Very, very well. The beans probably do not need such a long simmer, but I decided to go a bit lazy with my food prep. Since I had Macintosh apples, which turn to mush when heated, I thinly sliced them. Thus, I had to wait for the slices to turn to mush. If you have an apple that keeps its shape, you will need to chop it up more finely. 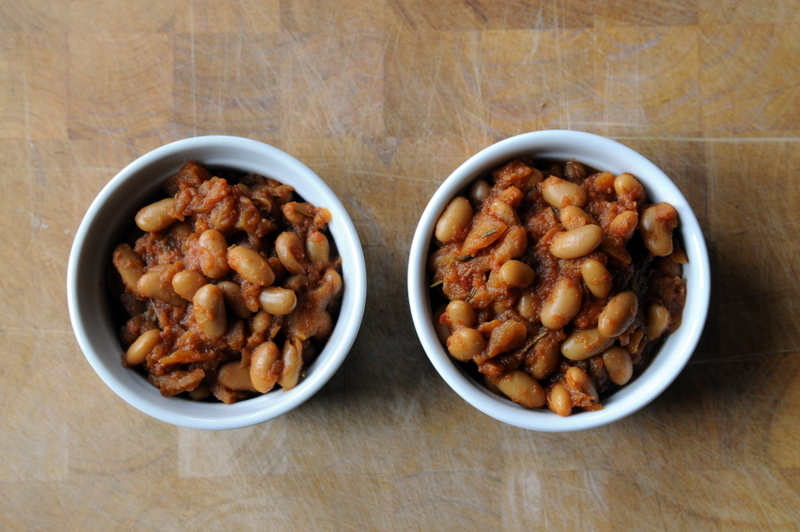 Most bean-centric dishes make good leftovers, but I loved these beans cold, too. I served them on top of fresh baby spinach for a nice, light meal. PS. The winner of The Great Vegan Bean Book giveaway is babette from Vegan in Montreal. Congratulations! I’ve told you my weekly menus now revolve around a new dressing. 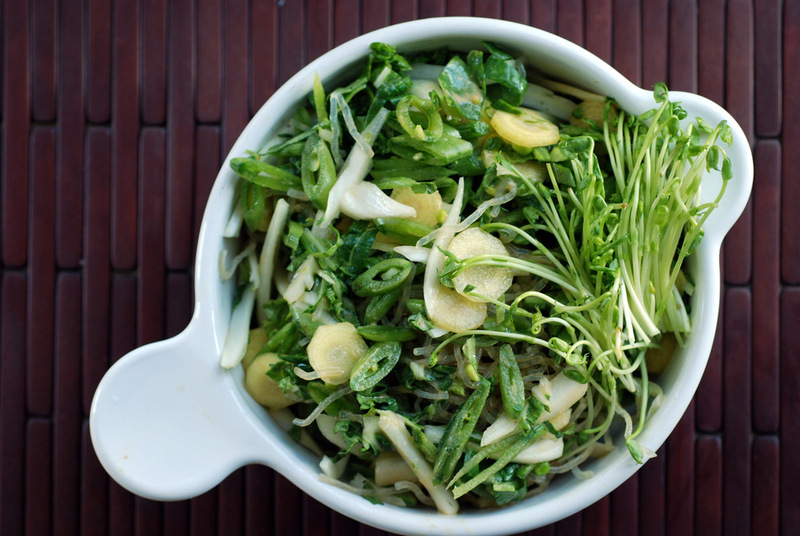 Now that veggies may not necessarily be at their peak, a good dressing is key to eating raw salads. Or, once you make this dressing, you may just decide to drink it instead. Forgetting the veggies altogether. It took me a long, long while to finally make Tess’ peanut sauce. Her recipe was daunting with the coconut milk, peanut butter and heavy use of agave. Tess’ last coconut-based sauce (the creamy Thai cilantro ginger sauce) was heavenly so I knew I should try it out. Eventually. However, I was guarding the last of our molasses for the recipe. With my pantry purge and gusto of tackling old bookmarked recipes from October, I finally took the plunge. With less sweetener, less sodium AND using coconut beverage, we have a winner. A drinkable winner. The twist from the other peanut dressings comes from the bite from molasses and umami from the fermented black bean sauce. Use it to coat anything. Veggies, grains, beans, you name it. 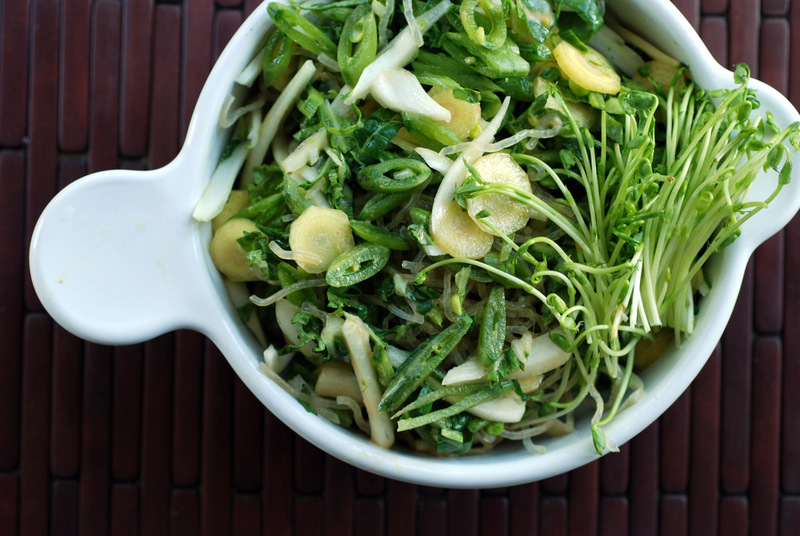 Here, I paired it with sliced carrots, thinly sliced sugar snap peas, julienned baby bok choy, kelp noodles and pea shoots. This is my submission to this week’s Presto Pasta Nights, hosted by Ruth (the last one!) and to Deb for this week’s Souper Sundays. While I didn’t make any resolutions for the New Year, one thing I am trying to improve in the kitchen is to become more flexible. Rob is good about perfecting a few key recipes or whipping up impromptu stir-fries whereas I prefer to keep trying something new. I realize this isn’t the most sustainable practice when life gets busy, so I am looking more into sauces that make the dish along with an assortment of vegetables with a grain or bean. In this case, the sauce is a toasted sesame orange teriyaki sauce from Radiant Health, Inner Wealth. It was easy to put together, and with freshly squeezed orange juice, the orange flavour was light, not dominant or ooky sweet. It can’t really compete with my salmon teriyaki, but it is nice in its own regard. 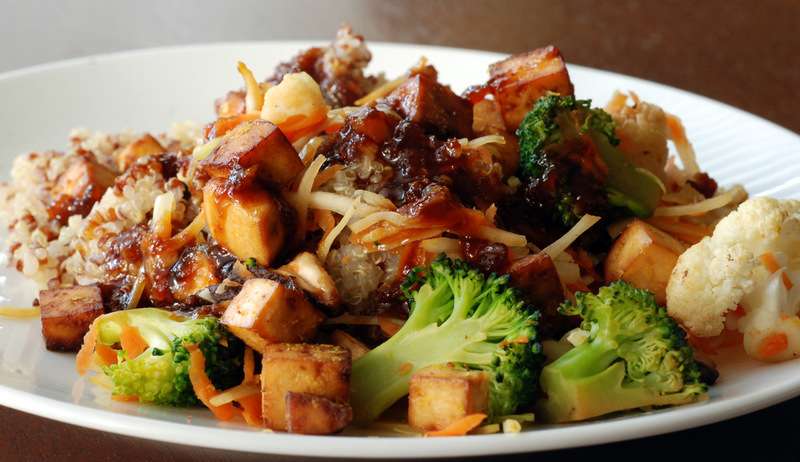 Tess suggests serving the sauce with a stir fry of veggies including garlic-infused shiitake mushrooms, broccoli, cabbage and carrot along with tamari-marinated baked tofu and rice. I added in some cauliflower to make up for my lack of broccoli and substituted quinoa for the rice (see, I am becoming flexible…). A sprinkle of toasted sesame seeds seals the deal for this simple weeknight meal. 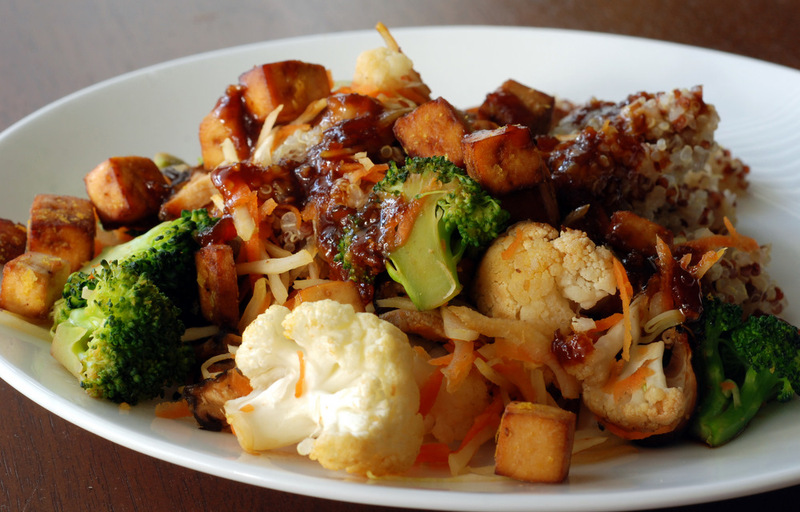 Use any combination of vegetables with your favourite grain, top with this teriyaki sauce and you have a fool-proof dinner. You could also stir-fry your veggies with the teriyaki sauce but I preferred its bright flavours as a sauce. I know this looks like a daunting recipe, but once you make the components – a big batch of quinoa (or your favourite grain), the teriyaki sauce, the baked tofu, and chopped veggies, you can easily whip up a quick weeknight dinner. This is being submitted to this week’s Healthy Vegan Friday, and to this week’s Weekend Herb Blogging, hosted by Lynne. One of my friends has a sulphite allergy. In short, she could have an anaphylaxis reaction (ie, really bad difficulties breathing) if she consumes sulphites. Sulphites are a commonly used preservative and found in a whole host of foods (processed food, beer, wine, dried fruit, etc). Canada is very good at making food producers label their products with any sulphites used, so I always check labels when I know my friend will be over. In reality, though, I don’t make many things from processed foods, so I should be ok, right? Well, as it turns out, I have been cooking with a few sulphite-laden ingredients – vegetable broth (not homemade), coconut milk and even dried fruit were among the many culprits I have found in my recent dishes. So when we needed an emergency girls night in, and when it was -28C outside (with the wind), I scoured for recipes I could make without venturing to the grocery store AND that had no sulphites AND that would taste best the next day as leftovers (since I wasn’t going to cook after work). A pretty onerous task, if I may say so myself! I narrowed my choices to two options: The New Spanish Table‘s Lentil and Pumpkin Stew with Roasted Garlic OR the Chili Fest Chili from Moosewood Restaurant Cooking for Health. 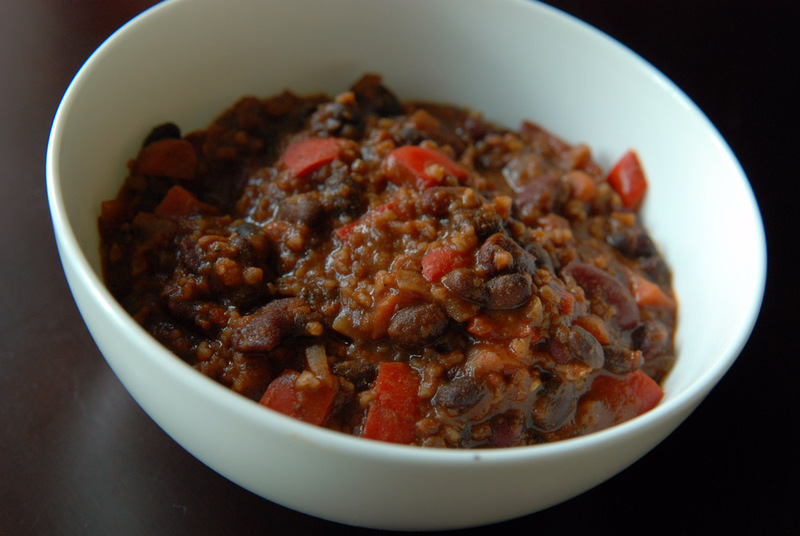 The chili was rife with savoury flavours like cinnamon, cloves, cumin, coriander, paprika and oregano. Oh, and molasses! Considering it was so cold outside, the chili won out instantly. 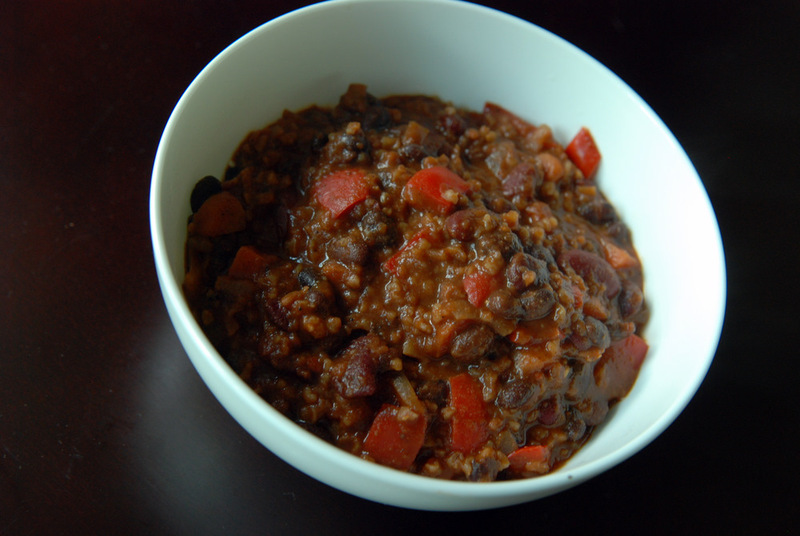 The result was a hearty chili with the mix of savoury flavours. Not my favourite chili, as something was a bit off and I prefer my chili with a bit more robust tomato flavour. Next time I might add some tomato paste. The bulgur, though, was excellent and a healthy way to get the mouth-feel of ground meat, without any meat at all. Other grains – millet, spelt, etc – could also be used. TVP is also an option. In any case, this is a nice way to warm up during the winter. Pair it with a leafy salad, some crusty bread, or just eat the chili plain. The original recipe called for a yogurt-cilantro topping to help with the heat. Personally, mine wasn’t a spicy chili but that’s because I didn’t put in the chipotle peppers! This is my submission to this week’s Weekend Herb Blogging hosted byAstrid from Paulchens FoodBlog.